Apple may completely ditch Qualcomm for a 5G modem in the future, with a new report claiming that iPhone engineers are working closely with Intel to deliver gigabit per second wireless speeds. A new account published by Fast Company on Thursday evening claims that Apple staff are "engaged with Intel counterparts" for work on a 5G modem for a future iPhone. If the report is accurate, Intel may completely unseat Qualcomm's dominance in supplying Apple since 2011. Sources familiar with the matter told Fast Company that the goal of the Apple and Intel project is to build an Intel modem into a system-on-a-chip that contains Apple's A-series processor, the GPU, and some other iPhone components —with it all fabricated at an Intel facility. Also on Thursday, Intel declared that it has completed a 5G call over the 28Ghz band with early prototypes of a new modem chip that it announced during the 2017 Consumer Electronics Show. Intel calls the test a "key milestone" in development of the new technology. At present, Apple uses Intel modems for T-Mobile and AT&T network-compatible phones. Qualcomm-sourced parts are used for phones destined for Verizon and Sprint customers. 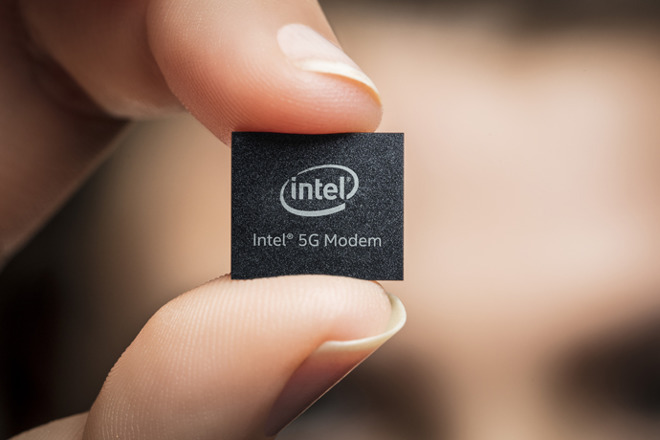 Intel's XMM 8060 chip for 5G networks will be available prior to broad deployment of 5G networks, which is expected in 2020. In October, reports were circulating that Apple was considering building its flagship mobile devices without Qualcomm chipsets, instead opting for cellular modems manufactured by Intel and MediaTek. Apple's legal battles with Qualcomm over licensing terms for modem chips is likely at the heart of the shift.